I had recently read something that had caught my attention. It was along the lines of people not wanting to hear truth anymore because they are so caught up in man made doctrines. The doctrine of the “rapture” whether its pre, mid or post has done so much harm that it has not only caused a huge division in Christianity (or so its called) but there seems to be a rage or anger that comes over people who are in disagreement with their views. Most of you that take the time to read these papers have witnessed this first hand. The entire belief and maybe I can say man made doctrine of September 23rds Revelation 12 connection is based entirely on a pre-tribulation rapture view. This is where this false sign emits from. The Great Latin Escape. I have been saying all year that this year of 5777 is a year of seperation and by this I mean that God is seperating the sheep from the goats. It is a time of harvest and the winnowing is taking place to see who is actually watching for the real signs. Who actually has there lamps full and who doesn’t? This leads me to this “great eclipse” in August. Let me say this first, I believe God has His own order in the sense that everything that is done in the physical will happen first spiritually. This is where discernment comes into play and the phrase “those who have eyes to see and ears to hear” might carry a stronger meaning. Now back to August. An eclipse is when the moon goes in front of the Sun and brings darkness for a certain amount of time in a certain area. It literally covers the light right? I believe this symbolism of this eclipse that stretches across the United States, that just so happens to start at the 33rd state (Oregon) and ends on the 33rd parallel (South Carolina), is representing the spiritual blindness that is upon the United States. And occultists believe that the number 33 represents the highest degree of spiritual achievement and the physical symbol is the “Third eye” or the all seeing eye. And don’t forget that these 9/23 rapturists make it known about this 33 conection. They made sure to let everyone know that August 21st is also 33 days prior to September 23rd. It may be safe to say that an eclipse can cause not only a physical darkness but also be symbolism of a spiritual darkness. This goes hand in hand with a spiritual famine during the time of harvest for actually not hearing (not just listening, there is a difference) the Word of God. It seems like this is what we have been seeing all year and it just seems to be getting worse and people are becoming more hateful and angrier. As August 21st comes closer its seems to be getting more intense. Atleast in my opinion. This brings us to Amos 8. I want you to read it and keep in mind everything I just said. And please, do not think that I am saying that Amos 8 is some fulfillment with the United States alone but what I am speculating is that we are seeing a type and shadow of Amos 8 with the United States on August 21st. 1 Thus hath the Lord GOD shewed unto me: and behold a basket of summer fruit. 2 And he said, Amos, what seest thou? And I said, A basket of summer fruit. Then said the LORD unto me, The end is come upon my people of Israel; I will not again pass by them any more. 3 And the songs of the temple shall be howlings in that day, saith the Lord GOD: there shall be many dead bodies in every place; they shall cast themforth with silence. 4 Hear this, O ye that swallow up the needy, even to make the poor of the land to fail, 5 Saying, When will the new moon be gone, that we may sell corn? and the sabbath, that we may set forth wheat, making the ephah small, and the shekel great, and falsifying the balances by deceit? 6 That we may buy the poor for silver, and the needy for a pair of shoes; yea, and sell the refuse of the wheat? 7 The LORD hath sworn by the excellency of Jacob, Surely I will never forget any of their works. 8 Shall not the land tremble for this, and every one mourn that dwelleth therein? and it shall rise up wholly as a flood; and it shall be cast out and drowned, as by the flood of Egypt. 9 And it shall come to pass in that day, saith the Lord GOD, that I will cause the sun to go down at noon, and I will darken the earth in the clear day: 10 And I will turn your feasts into mourning, and all your songs into lamentation; and I will bring up sackcloth upon all loins, and baldness upon every head; and I will make it as the mourning of an only son, and the end thereof as a bitter day. 11 Behold, the days come, saith the Lord GOD, that I will send a famine in the land, not a famine of bread, nor a thirst for water, but of hearing the words of the LORD: 12 And they shall wander from sea to sea, and from the north even to the east, they shall run to and fro to seek the word of the LORD, and shall not find it. 13 In that day shall the fair virgins and young men faint for thirst. 14 They that swear by the sin of Samaria, and say, Thy god, O Dan, liveth; and, The manner of Beersheba liveth; even they shall fall, and never rise up again. Amos wrote this to Israel at the time of their physical harvest. They knew the physical connotations of what he was saying but I do wonder if they realized the spiritual ramifications to what was being said here. They were to have a famine not only physically but spiritually and this is what was being said. Now fast forward to today. We aren’t seeing a physical famine as of yet in the United States but there is definitely a spiritual famine sweeping across the land. Take a closer look at verse 9-11 (and notice the significance of the numbers of 911). Now I want to be careful with what I’m saying because I want to stress that I’m not saying this is a fulfillment of these verses. I’m saying that it is very interesting with what is actually going on here. In verse 9 it talks about the Sun going down in the day and bring about darkness. I’m not saying this is a eclipse because the wording of it alludes to the Sun actually setting. I just find the application here to what Amos is saying, a lot like what we are seeing in the very near future pn August 21st. Then Amos mentions how God will turn their feasts into mourning. Now please tell me, what feast is September 23rd falling on this year? Need I say anymore? He then goes on to connect all of this to the time of the harvest and a famine from hearing the Word of God. And who is the Word that became flesh? Jesus. The 9/23 rapture cult claims they are watching but they aren’t hearing or listening for that matter. They are completely blinded from hearing what the Word is saying. They deny that the sign of Revelation 12 has anything to do with the birth of Jesus and impart themselves into this scripture as these pious church folk to be raptured from harms way. They are doing more harm exegetically than good. Now I want you to look at the LXX and Polyglot Greek of what Amos was saying in this verse. 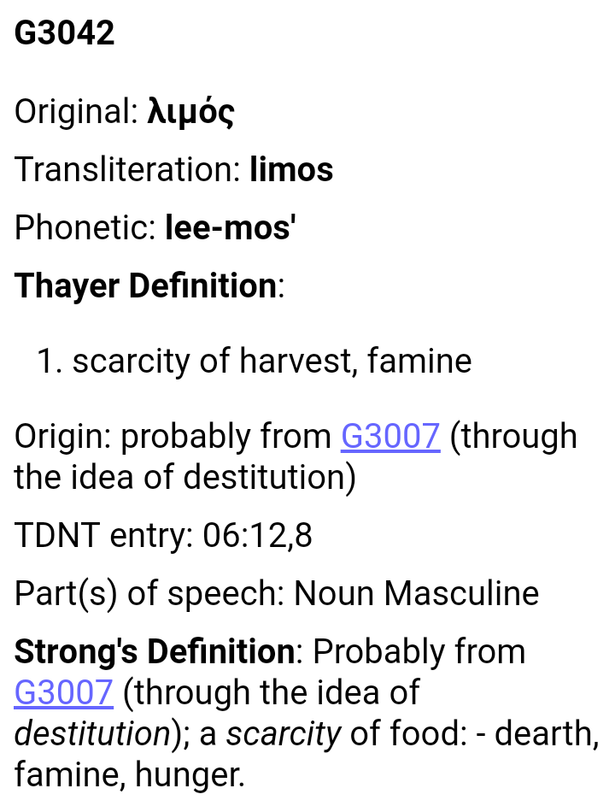 Notice the Strongs definition of the Greek word limos which is famine. It specifically says a “scarcity of harvest”. I believe as far as the United States goes that this is what we are seeing…a famine in hearing the Word of God today is caused by the scarcity of this harvest. Now look at the word that limos is associated with that deals with destitution. 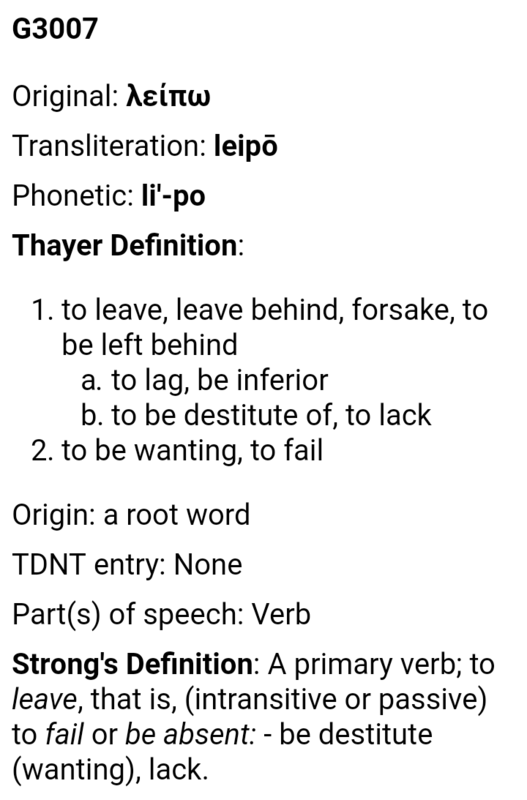 Leipo literally means to be left behind. Doesn’t this sound like a famous movie and books by the same name that promotes false doctrine? The irony definetly isn’t lost on that one. So with all that said, I do believe that there is a connection to this August eclipse, seperation in the sense of a harvest and a famine in hearing the Word of God. I may be wrong but I’d rather stear clear of all this false doctrine and stay on the safe side.